St. Martin Church was built in 1178 - 1187 in the settlement Újezd, which extended then in this area. After the church had been dedicated to St. Martin, the settlement was called Újezd of St. Martin. When the Old Town walls were built in the first half of the 13th century, Újezd was divided by it into two parts. The larger part was left outside the walls on the grounds of the later New Town; the smaller part together with the church became a part of the Old Town. The south wall of the church fit tightly to the town walls (therefore the name); in its neighbourhood there was a town gate, which was called St. Martin Gate. The original Romanesque church had one nave, which has been preserved in the present nave with many architectonic Romanesque elements. Interior of the church was probably decorated with Romanesque wall paintings. After 1350, during the reign of Charles IV, the church underwent the Gothic reconstruction. The nave was elevated and newly vaulted and on the south-west corner there was a rectangular wall built and constructing a presbyterium with a square base enlarged the whole church. Between 1360 and 1370 the presbyterium got a groined vault which is said to be one of the oldest of this kind in our lands. The groins of the vault rise from a bracket decorated with masks, the coping stones are decorated with rose and star. Such was the appearance of the church in 1414, when in the end of October the local pastor Jan from Hradec incited by M. Jakoubek from Stříbro for the first time served the altar sacrament in both kinds to laymen. In the following years the chalice became the symbol of the Hussite revolution. The church gained its present shape in the late Gothic reconstruction. This went on gradually and was finished in 1488, stimulated and sponsored by the utraquist bourgeois Holec family from Květnice. At that time there were two transepts built, one in the north with three cruciform spandrels and the other in the south with two of them. The Holec family also had an oratory constructed to the east wall of the north aisle called the Holec oratory. It was connected by a wooden bridge with their neighbouring house (at present the north wing of Platýz). Today there is a portal visible in the church at the level of the first floor, which leads to the oratory, and on the outward side there are apparent traces of a bridge and a banister. The coat of arms (a hook) which is on several places of the church reminds us of the Holec family from Květnice. The coat of arms on the vault of the presbyterium, figuring half a dog, is from the beginning of the 16th century and belongs to the Beneš family from Vlkanov, the relatives of the Holeces. The St. Martin in the Wall Church burned down in 1678; the upper part of the tower was rebuilt after the fire. In 1779 there has been another major reconstruction, the Baroque portal on the north side (to the street). Shortly after that, in 1784, the church was made void and was turned into a warehouse, flats and shops. 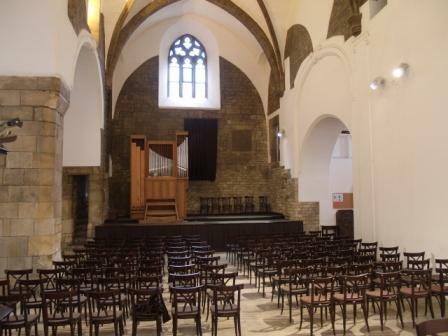 In 1904 the Prague municipality bought the church and in 1905–6 reconstructed it according to the plans of Kamil Hilbert. At that time there were Neo-Renaissance gables added to the tower which already bore the coat of arms of the Old Town. After the First World War, the Evangelical Church of Czech Brethren obtained a long time rent of the church. Through the care of ECCB the church went through a general reconstruction and an archaeological investigation took place there. subway - green line A station " Mustek " then by walk 400 meters via " Rytirska " street and second street turn to the left and you will see church St. Martin on the Wall - 7 minutes easy walking from subway station " Mustek "